An above ground pool deck allows you to make better use of the area around your pool and can increase pool safety. What type of pool deck you choose will depend on the size of your yard, budget, and the location of your house. A freestanding pool deck is adjacent only to the pool itself. It may completely surround the pool or only be attached to it by a small walkway. By far the most common type of pool deck, they are relatively inexpensive and easy to construct. This type of pool deck receives support from some type of foundation, ranging from floating footings to a traditional poured foundation. An attached pool deck receives some support from the house while providing a direct path from an exterior door to the pool. These pool decks can make an above ground pool appear like an in-ground pool and often require less space to construct. However, depending on the elevation of your home, the pool, and the surrounding site, you may not be able to build one. For this type of pool deck, a licensed contractor is essential, especially because supports are often attached to your home. There are three common deck designs used for above ground pools. The one you choose will depend on the size of your yard as well as your budget and family's needs. A platform deck is the smallest type of pool deck. It consists of a small deck that is elevated to the level of the pool to provide a space for people to sit near the pool. It does not conform to the shape of the pool. A single side deck runs along one side of an above ground pool. It should conform to the side of the pool, allowing swimmers to climb onto the deck from the pool at any point. Single side decks are most often larger than platform decks. They may feature enough space for a grill, a few lounging chairs, or even a table. An all around deck encloses the pool on all sides. It allows entry to the pool from any side, and is typically the largest type of pool deck. Attached pool decks are often modeled on an all around design to make the best use of the space. Grills and patio furniture are common embellishments for this type of deck. No matter which type or design you choose, all pool decks should have a few common features. Pool decks can be made of wood, composites, or even preformed plastic. Wood is the most popular choice because it is easy to use, inexpensive, and common. If you decide to use wood, be sure to choose pressure-treated lumber that will resist rot and plan on buying the best deck stain and sealant you can afford. Composites that look like wood are a good choice if you have a larger budget and want to avoid regular maintenance. Preformed plastic decks require even less maintenance, but are often small and inappropriate for a pool that is used often. 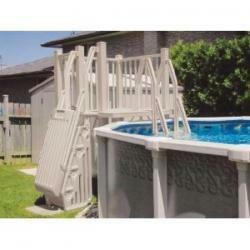 Above ground pool decks should have a deck railing that surrounds the entire perimeter as well as a gate or door that can be locked to prevent unnoticed entry into the pool. Even if the occupants of your house follow pool safety rules, you are still responsible if a child wanders into your yard and falls into the pool. You should also consider adding a slip-resistant material to stairs and commonly wet areas to prevent falls. If you have a platform deck, the area that allows you to get into the pool should be wide enough to accommodate two adults. This not only makes the pool easier to use and more comfortable for all swimmers, but ensures that someone in distress can be retrieved from the pool quickly. Building an above ground pool deck is beyond the skill set of most homeowners, so finding a reputable contractor is essential. Ask for recommendations from other pool owners and don't be afraid to ask questions during the hiring process. Be aware that most decks take one to two weeks to construct, so you may want to schedule this particular project for early spring or late fall when the pool won't get as much use. After your deck is built, plan on scheduling annual checks to identify any possible structural issues. 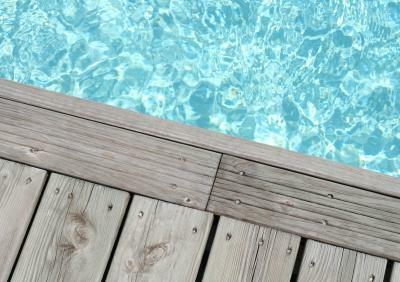 For more information about installing decking around a pool or any other outdoor area, please read the following LoveToKnow Home Improvement articles.